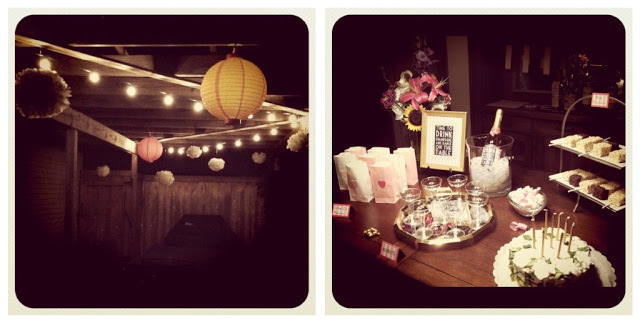 With her inspiration selected, this lovely Minnesotan set to work to pull together a picturesque birthday bash to kick-off another fabulous, 20-something year--without reverse mortgaging the house. When asked about her party, she said, "I haven't done too much for my birthdays in the past, but for some reason this seemed like the year to go all out! I'm notoriously girly--ruffles, bows, flowers and pink have special places in my heart (and in my wardrobe!). 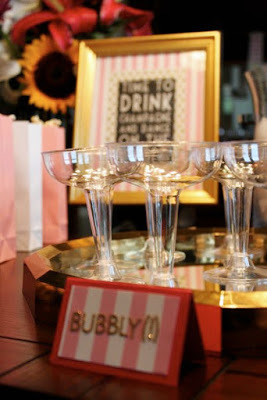 I'm also quite partial to champagne, so a pretty, bubbly party seemed like a natural fit!" So how'd she pull off such a fabulous shin-dig on a budget? DIY. Turns out that some of her favorite details ended up being ones she made herself! 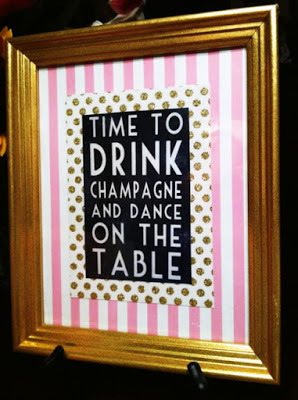 Among the top picks--her champagne bottle labels and gold tinsel swizzle sticks. And the gorgeous mirrored tray that held the champagne glasses. Thrifted (a $2.99 score from Goodwill!!). She was pretty jazzed about that find (and for good reason!). Katie certainly modeled the way for the rest of us on this one. Her event reminds us all that with a good-eye, an I-can-do attitude, some raw domestic talent, and a little help from your friends picturesque is obtainable for any event. And pssssst, if you have an upcoming party of your own, I was assured that her "Rice Krispcicles" were a big hit, and *so* easy to make. Thank you, Katie, for sharing a little bit of the magic--and your images--with Charles and BunBun. We consider ourselves lucky to have you here!! You can find more Katie over at Husband, Wife, Modern Life.